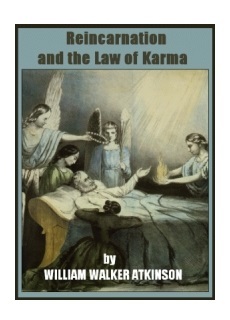 This 148-page ebook is the study of rebirth, and spiritual cause and effect. By “Reincarnation” we mean the repeated incarnation, or embodiment in flesh, of the soul or immaterial part of man’s nature. It is usually held that the rebirth is governed by the law of attraction, and which law operates in accordance with strict justice, in the direction of attracting the reincarnating soul to a body, and conditions, in accordance with the tendencies of the past life, the parents also attracting to them a soul bound to them by some ties in the past, the law being universal, uniform, and equitable to all concerned in the matter. The Reasons of Rome’s Backwardness in Spiritual Knowledge—Why the Greeks were Advanced—Pythagoras; Orpheus; Plato—The Various Grecian Teachings Regarding the Soul and Its Future Life—Plato’s Wonderful Teachings and Philosophy. Reincarnation in the Modern Western World—The Revival of Interest and Its Cause—Theosophical Society—Madame Blavatsky—The Western School of Yogi Philosophy: Its Fundamental Teachings—The Spiritists, and Their Doctrine—The Teachings of the “Elect Few” in Their Secret Societies—Is Earth a Hell?—Christian Reincarnationists and Their Beliefs. The Contrasting Theories of the Soul and Its Future Life—Doctrine of Reincarnation the Only Philosophical Theory that Reconciles Facts with Theory—The Law of Karma Automatic and Enforces Itself—Every One Their Own Judge and the Executor of Their Own Destiny—The Opinions of the World’s Great Thinkers. Necessary for the Soul’s Education—Advancement Necessary to Enjoyment of the Soul’s Higher States of Being—The True Teaching.